Radiation dose measurement at selected locations around the experimental facilities of a research reactor was carried out. Passive dosimeters based on CR-39 and CaSO 4 :Dy Teflon disc and 6 LiF:Mg,Ti and 7 LiF:Mg,Ti based neutron and gamma dosimeters were used in the study for the measurement of ambient dose equivalent (H*(10)). Measured neutron and gamma dose equivalent rates were found to be within the stipulated limit as per the guidelines of Atomic Energy Regulatory Board (the regulatory authority of India) for the radiation workers. The use of anion exchange chromatography for the separation of Pu and extraction chromatography technique for the separation of Am from urine samples was studied. In the earlier method, Pu separation was carried out by anion exchange chromatography followed by Am separation by cation exchange chromatography. The chemical recovery of Am obtained by cation exchange separation method was inconsistent and low in the range 30-70%. In this study, the average Pu recovery obtained using anion exchange chromatography was 89.2 with standard deviation of 10.4 and the average Am recovery obtained using extraction chromatography with TRU resin was 77.4 with standard deviation of 14.8. Moreover, Am separation could be completed within three hours using the TRU column compared to two days that were required for the cation exchange chromatography. After-Fukushima incident, various concerns were raised by public and media about the safety of nuclear installations operating all around the world. All nuclear related eventualities of the past were meshed with the present, adding disproportionate factors, unrealistic conclusions were framed based mostly on notions. Fear of unknown radiation syndrome has played up on the minds of common man. India, on a verge of entering path-breaking nuclear energy arena, obviously could not be isolated from such concerns. Such issues were discussed with ongoing protests at Jaitapur and Kudankulam. This paper discusses various concerns expressed after Fukushima incident, overview on proposed Jaitapur nuclear power plant and justifications to the raised concerns. Each year for the past few decades during the Southern Hemisphere spring, chemical reactions involving chlorine and bromine cause ozone in the southern polar region to be destroyed rapidly and severely. This depleted region is known as the "ozone hole". Throughout the 20th century, discoveries and observations allow scientists to understand how human-made chemicals like chlorofluorocarbons create a hole in the ozone layer over Antarctica each spring. There has been an increased interest in strontium-89 (Sr-89) therapy, which emits relatively high-energy (1.495 MeV) beta rays. The production in vivo bremsstrahlung radiation sufficient for external imaging and this radiation hazard warrants evaluation. The bremsstrahlung (secondary radiation) of Sr-89 has been traditionally ignored in internal dosimetry calculation. We have estimated the bremsstrahlung dose of Sr-89 source in the muscle and bone to body the various body organs (such as adrenals, brain, breasts, gallbladder wall, LLI wall, small intestine, stomach, ULI wall, heart wall, kidneys, liver, lungs, muscle, ovaries, pancreas, red marrow, bone surfaces, skin, spleen, testes, thymus, thyroid, urine bladder wall, uterus, fetus, placenta, and total body) from distributed sources of Sr-89 in the muscle and bone. In the present study, muscle and bone is considered as source organs. The bremsstrahlung dose of Sr-89 source in a muscle is less than that of cortical bone. In both muscle and bone medium, bremsstrahlung dose decreases with distance. These estimated values show that the bremsstrahlung radiation absorbed dose contribution from an organ to itself is very small, but contribution to other organs is not always negligible especially when large amounts of Sr-89 may be involved as in therapy applications. The radioactivity of some building materials used in Tiruvannamali City has been measured using a NaI (Tl) detector based gamma ray spectrometer. The distribution of natural occurring radionuclides ( 226 Ra, 232 Th and 40 K) in the building materials was studied. 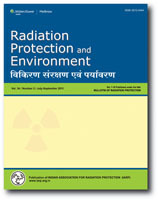 The radium equivalent activity (Ra eq ), the activity utilization index (I), external hazard index (H ex ) and internal radiation hazard index (H in ) associated with the natural radionuclide are calculated to assess the radiation hazard of the natural radioactivity in the building materials. The present work shows that the natural radioactivity levels in the building construction materials used in Tiruvannmalai City is well below the acceptable limits. From the analysis, it was found that these materials may be safely used as construction materials and do not pose significant radiation hazards. The natural radionuclides activity concentrations in beach sand of the extreme south of Bahia, Brazil, was measured by Gamma Spectrometry. 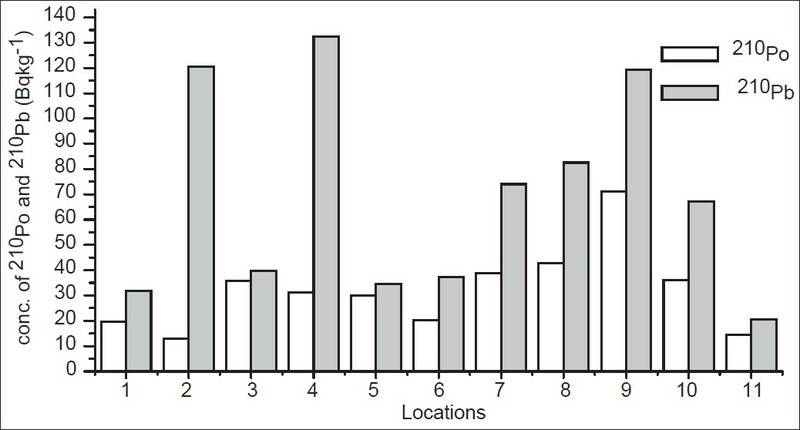 The Radium Equivalent Activity, the external hazard index, the absorbed dose rate and the annual effective dose were assessed and compared with internationally published values for external dose and activity concentrations. The activity concentrations of 226 Ra, 232 Th and 40 K in beach sand ranged from 8.4 to 8,300 Bqkg -1 with a mean value of 910 Bq.kg -1 , from 21 to 18,450 Bqkg -1 with a mean value of 2,220 Bqkg -1 and from 3.4 to 3,110 Bqkg -1 with a mean value of 352 Bqkg -1 , respectively. The results indicate that the absorbed dose rates range from 21 to 14,450 nGyh -1 with mean value of 1,792 nGy.h -1 . The highest value of gamma dose rates among the studied beaches were found in Cumuruxatiba (14,450 nGyh -1 ). The annual effective dose range between 0.03 and 17.70 mSvy -1 , with the mean value of 2.20 mSvy -1 . In four studied beaches, the assessed outdoor annual effective doses are above the worldwide average of 0.07 mSvy -1 as reported by the United Nations Scientific Committee on the Effects of Atomic Radiation. Especially in the area of black sands, a big part of Cumuruxatiba beach, whose annual effective dose of 17.70 mSvy -1 is much higher than worldwide average. Nanoparticles of CaSO 4 : Dy with size around 25 nm, were synthesized by the chemical co-precipitation method for the purpose of high energy electron dosimetry. 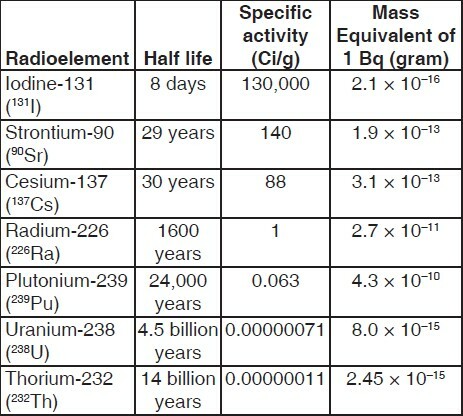 The nanocrytstalline samples were irradiated with 6 MeV energy electrons having fluence varied from 3 × 10 14 to 2 × 10 15 e/cm 2 .The pre and post irradiated samples were characterized by the XRD, SEM, PL and TL techniques. The XRD spectra show the orthorhombic phase and do not change with the electron fluence. Moreover, the particle size found to be around 25 nm and marginally increased from 25 nm to 34 nm with the increase in the electron fluence. SEM image confirms the existence of the nanoparticle around 30 to 40 nm. In PL emission spectra, a shift towards lower wavelength has been observed with decrease in particle size from micrometer to nanometer. This mainly attributes to the extension in the band gap of Dy 3+ ions. The TL spectra exhibit four peaks at around 437,545,638, and 748 K respectively. The TL response curve shows that the peak intensity initially increased with electron fluence, and at a fluence of 9 × 10 14 e/cm 2 saturates then decreased with increase in the electron fluence. It is mainly due to the generation of different kinds of trapping centers. The present study indicates that the CaSO 4 : Dy phosphor can be used for the measurement of dose of 6 MeV energy electrons over a range varying from 1 kGy to 25 kGy. The radioassay of samples containing three pure beta emitters having various activity ratios has been performed by using the most probable value theory applied to liquid scintillation detection. The principle of the technique is based on experimentally generating simultaneous equations more than the radionuclides to be analyzed. This technique requires a liquid scintillation counter and sets of quenched radionuclide standards. The present technique has been applied successfully to the case of 3 H- 35 S- 36 Cl in composite mixtures. Cultivation of land modifies soil characteristics and influences redistribution of radionuclides in topsoil. The concentrations of 210 Po and 210 Pb in the cultivated land of Chikmagalur were measured by wet ashing silver planchet electroplating alpha count method. The concentration of 226 Ra was determined using Emanometry Method. The samples were precipitated by chemical processes and the concentrations of 228 Ra measured using high efficiency low level background gas flow beta counter. The lowest activity of 226 Ra, 228 Ra 210 Po and 210 Pb recorded at study area were 6.1, 5.6, 12.9 and 20.6 Bq.Kg -1 and maxima were 47.7, 29.6, 71.2 and 120.5 Bq.Kg -1 and mean 13.8, 19.2, 28.6 and 1.8 Bq.Kg -1 respectively. The mean of ratios of 210 Po and 210 Pb in cultivated and uncultivated land were found to be 0.53 and 1.06 respectively. Concentrations of 226 Ra, 228 Ra and 210 Po in cultivated land found to be lower than that of undisturbed land but reverse in case of 210 Pb. Decrease in activities of 226 Ra, 228 Ra, and 210 Po in cultivated may due to wash out of 'floating fraction' with rainwater and the increase of activity of 210 Pb may be due to re-suspension. The 're-suspension factor' (K) increases for 226 Ra, 228 Ra, and 210 Po in cultivated and fertilizer added area, but not for 210 Pb. Also the concentrations of radionuclides were found to be high in comparison with global and Indian average. In this study, the result of systematic measurement of activity concentration of 222 Rn in drinking water from sources of public water supply along the coastal regions of Kerala is discussed. The 222 Rn concentrations in water were measured using the emanometry method and it was found to vary from 0.03 to 1.31Bq l−1 . The associated effective doses were computed for the population of the region. Present work highlights liquid scintillation Automatic Efficiency Control (AEC) as a tool for simultaneous determination of gross α and β activities in composite samples. AEC which is in-built feature in Packard Tri-Carb 2900TR Liquid Scintillation Counter (LSC) provides automatic counting region adjustments for single and dual label samples according to the degree of quench present in sample. In the present study, α/β spiked composite samples were treated as dual label samples with α and β radio-nuclides as two distinct entities contributing to the gross activities and analyzed employing AEC technique. Instrument discriminator settings and regions of interest (ROI) were evaluated to determine optimum counting conditions for present technique. Three sets of pure alpha and pure beta standards simulating the activity concentrations of real samples in terms of α/β activity ratios were used to calibrate LSC. Calibration methodology for Packard Tri-Carb 2900TR LSC with respect to the above measurements using 241 Am, 36 Cl calibration standards is explained in detail. The practicability and working performance of AEC technique was checked by the validation trials with spiked synthetic samples covering range of α/β activity ratios from 1:1 to 1:30 and 30:1. Carbon-14 ( 14 C) is present in the environment and in all organic materials and behaves in the environment in the same manner as other carbon isotopes. In medicine, 14 C can be injected to study abnormalities of metabolism that underlie diabetes, gout, anaemia and acromegaly (adult "gigantism"), and for diagnosis of Helicobacter pylori (H. pylori). The discovery H. pylori by Warren and Marshall in 1982 changed the approach to treat peptic ulcer disease (PUD). Since then H. pylori has been the focus of clinical research and debate. The causal relationship between H. pylori infection and chronic gastritis is well established. H. pylori infection is one of the most common human infections worldwide. This organism has been shown to infect over half of the world's population. 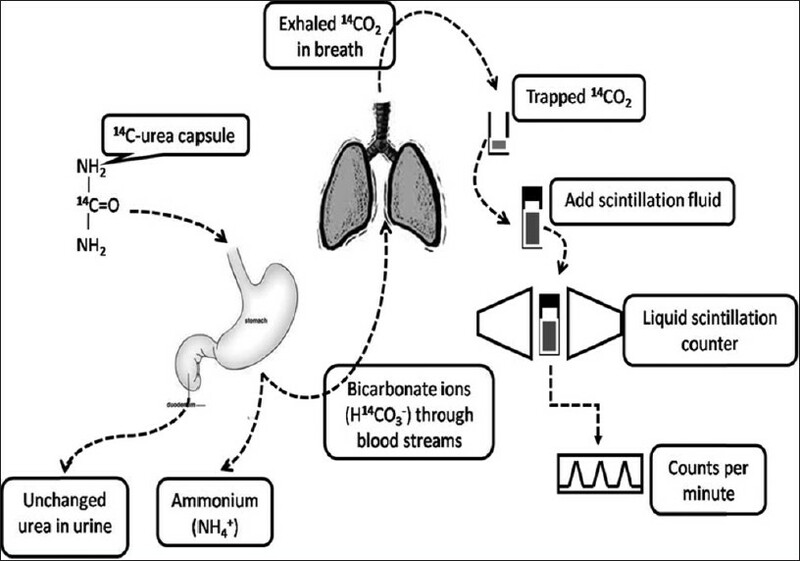 This article presents the application of 14 C Urea Breath Test ( 14 C UBT) for the diagnosis of the H. pylori bacteria which present in the stomach and duodenum. 14 C UBT relies on the urease activity of H. pylori to detect the presence of active infection. 14 C UBT has proved to be one of the most accurate methods for assessing H. pylori status. The ionizing radiation dose involved in this test is extremely low, much lower than the radiation dose due to natural sources. 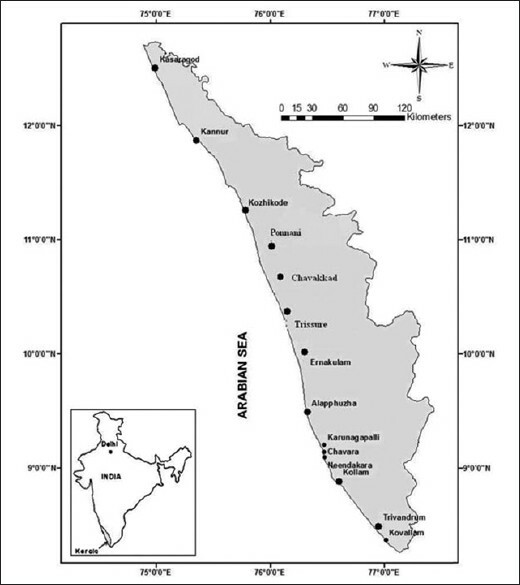 209 samples collected from both symptomatic and non-symptomatic persons of Dakhina Kannada District, Karnataka were analysed and the results with discussion are presented in this paper. The grass to milk transfer coefficient is usually represented as F m values. This paper reports the results of grass to cow milk transfer coefficients (F m ) for Cesium for emergency situation. An experimental grass field was developed in Kaiga region and two cows were adopted for collecting milk samples regularly. Grass was cut from the field and spiked with very low concentration of Cs (in the form of CsCl or CsI), to simulate a sudden deposition of Cs on grass and fed to the adopted cows. The milk samples were collected during normal milking periods (morning and evening) for several days and analyzed. 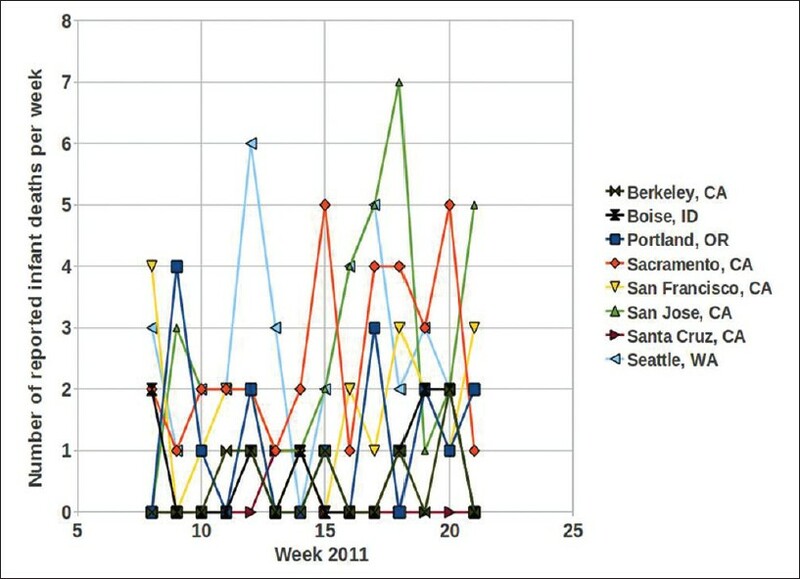 The peak concentration of Cs in milk was observed during time period 24-36 hrs after the intake of spiked grass. Three spike experiments were carried out and values of F m were found to be 7.8 × 10 -3 d L -1 , 3.5×10 -3 d L -1 and 2.4×10 -3 d L -1 . The grass to milk transfer coefficient values observed under spiked conditions were an order of magnitude lower when compared to the equilibrium transfer coefficient for Kaiga region, which highlights the importance of studies aimed at generating site-specific database on F m for simulated emergency situation.